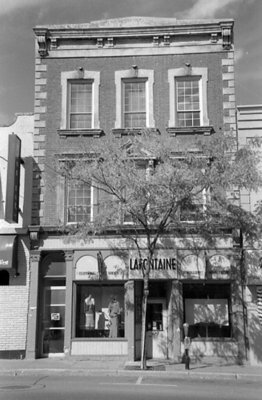 A black and white photograph of 106 Dundas Street West. In this photograph the sign for Lafontaine Trading Post can be seen. This three-storey brick and stone store is located at 106 Dundas Street West (on the north side of Dundas Street, three doors west of Brock Street). The building was known as Bigelow's Block. It was built around 1860 and operated as a dry goods, groceries and stationery store by Joel Bigelow. 106 Dundas Steet West, October 2005, Carl Ferencz. Whitby Archives A2013_016_002B.